Latest News: At their April 12 meeting in Redondo Beach, the California Coastal Commission voted 9:3 to take a formal position opposing AB-1196, the City’s bill proposing to amend the Coastal Act to add Newport Beach to the list of specially privileged coastal ports. See the video of the meeting, starting at 1:41:20. With the CCC opposition in mind, the City Council considered its next steps as Item 10 on its April 24 agenda. The Council chose to terminate the contract the it had with an outside consultant to promote the bill. As a result the effort to promote a Port Master Plan for Newport Beach appears to be dead for the moment. Project Overview: This is a proposal to amend the state’s Coastal Act to add Newport Beach to the list of coastal deepwater industrial “ports” authorized to locally approve permits for activities over which the California Coastal Commission would normally have “original jurisdiction,” including, it is claimed, harbor dredging and and the construction and modification of piers over public waters. This would be accomplished via adherence to a detailed “Port Master Plan” — a document each commercial seaport named in the Act is required to prepare and have certified by the Commission. Why We’re Watching: Whether or not seeking local control of matters the state legislature has placed in the hands of the Coastal Commission is a laudable goal, or not, this proposal raises serious concerns as to both substance and style. The legislation, how it would function, and its costs and consequences do not seem to have been well thought out, and the bill itself (AB-2464, now AB-1196) seems to have been developed privately by unknown authors and introduced without any review by the Council. And bringing the City under an umbrella intended for major commercial seaports seems at best a very awkward fit for Newport Beach. In contrast to our City, the four entities presently authorized to operate under Port Master Plans were all active state-recognized deep-water shipping centers prior to the Coastal Act and were allowed to continue under somewhat relaxed permitting rules precisely to confine such heavy industrial activity to limited areas along the coast. The kind of commercial activity Port Master Plans were created to control simply doesn’t happen here. Since (aside from the Catalina Flyer) there is little, if any, port-like activity in Newport Beach, the proposal to obtain local control of permitting by adding Newport Beach to the list of California’s major seaports seems fanciful. But whether intentionally or not, it does hark back to an earlier drive, a century ago, to promote Newport as the shipping center for Orange County, which led to the successful 1919 countywide bond issue portrayed in the handbill at the top of the page (intended to implement the 1917 plan, shown at left, to, among other things, dredge a channel to what were expected to be bustling new County wharves and warehouses at the terminus of a rail line coming down what is now Newport Boulevard). To date, nothing more has been heard of the matter, and no funds appear to have budgeted for the effort in Fiscal Year 2018-2019. April 24, 2018: As Item 10 on its agenda, the City Council was asked to select from a range of options for its contract with Schmitz and Associates for advocacy of AB-1196. With Council member Herdman absent, Mayor Duffield recused and Council member Peotter opposed, the Council approved a motion by Council member Dixon directing the City Manager to terminate the advocacy contract with lobbyist Don Schmitz and promising to revisit options for the harbor at a future time. The “history” section of the state legislature’s website for AB-2464 originally predicted the bill might be heard by the Assembly’s Natural Resources Committee on March 17, but their next meeting was April 9, and AB-2464 didn’t appear to be on the agenda. Meanwhile, AB-2464 appeared to have been abandoned, and the City was now promoting AB-1196, a nearly identical bill created by “gutting and amending” one already before the Senate. AB-1196 had been assigned to the Senate Natural Resources and Water Committee. Per their schedule, assembly bills will be reviewed on June 12 and June 26. Comments may be sent to the committee and its members. See directions here. April 19, 2018: The California Senate Rules Committee referred the new AB-1196 to the Senate Committee on Natural Resources and Water. April 12, 2018: After receiving the April 9 staff analysis and hearing public comment on it at their meeting in Redondo Beach, the California Coastal Commission voted 9:3 to oppose AB-1196 . The vote occurred as part of Item W6c, the Legislative Report trailed from the Wednesday agenda. The Commission’s discussion of AB-1196 (which at several points drew audible laughter from the audience) can be reviewed in the video of the meeting, starting at 1:41:20. Paid Newport Beach lobbyist Don Schmitz and Council member Scott Peotter asked, unsuccessfully, for a 30 day delay in the Commission’s vote. April 9, 2018: California Coastal Commission staff posted an analysis opposing AB-1196 as part of their April Legislative Report, Item W6c, which the agenda said would be “trailed” to April 12. April 3 @ 5:30 – 6:30 pm: The City’s coastal consultant, Don Schmitz, gave a talk about the proposed Port Master Plan and his prior accomplishments for “our” City to the Marine Committee of the Newport Beach Chamber of Commerce. The presentation was at Marina Park, with a Parking Code of 170434. April 2, 2018: AB-1196, as gutted and replaced, was withdrawn from the Government and Finance Committee and sent back to the Senate Rules Committee for assignment to the proper committee for review. March 27, 2018: There seems to have been a private reversal of the March 13 direction for Council members Dixon and Peotter to flesh out the details of what the City might expect to accomplish, while City staff issued a Request For Qualifications for a lobbyist, other than Sean Henschel, to promote AB-2464 in Sacramento. As Item 12 on its March 27 agenda (see video), the City Council (by 6:1 with Mayor Pro Tem O’Neill casting the NO vote) approved a six month $120,000 contract with consultant Don Schmitz ($16,000 per month, including $32,000 on signing for work already performed) to promote legislation adding a still-to-be-defined “Port of Newport Beach” to the list of commercial seaports required to create a Port Master Plan under the Coastal Act. Mr. Schmitz was present and provided clarifications of the proposal “we” would be promoting. He said that although called a “port plan” it would apply only to the water portions of Newport Harbor, and that the principal reason for wanting it is that it would ensure local approvals for development in the harbor could not be appealed to the Coastal Commission. At the meeting, it was also announced that the City is now promoting AB-1196 which seems to have replaced the earlier AB-2464, although the status of AB-2464 is unclear, since it does not seem to have been formally withdrawn. As to AB-1196, Assembly Member Sharon Quirk-Silva is an additional co-author, along with Assembly Member Harper and State Senator Moorlach. March 22, 2018: An earlier, failed bill by Assemblyman Harper, AB-1196 having to do with the allowable duration of school bonds, stuck in the state Senate Government and Finance Committee, was subjected to the “gut and amend” process, whereby the original text was replaced by something similar, but not identical, to the text of AB-2464. As explained at the March 27 City Council, this apparently moves the item forward at a faster pace through the legislative review process, since AB-1196 was already in the Senate. March 16, 2018: City Manager Kiff appears to have arranged a meeting of Herdman with himself, Dixon and former Council member Selich (see email here). March 15, 2018: Council member Herdman sent a long email (here) to Council members Peotter and Dixon expressing multiple concerns about the City’s goal and the lack of groundwork leading up to the introduction of the bill. March 13, 2018: As Item 16 on the March 13, 2018, agenda (see video), a somewhat befuddled Council (with Mayor Duffield recusing himself) wondered how the legislation got introduced and whether it was something the City wanted, was asked to appropriate $120,000 to fund the first six months, or so, of staff’s effort, the money to go to coastal lobbyist Don Schmitz, and a friend of his, legislative lobbyist Sean Henschel. The Council as a whole had not previously seen the measure text, but in the staff report, and during the discussion, it was revealed that Schmitz had been working with the City Manager and unidentified Council members (presumably Duffield and Peotter) on this without contract since late 2017. As on February 13, Item 16 was listed on the agenda in such a way that even the most attentive would not have known anything related to the proposal for a Port Master Plan was on it. The Council did not approve the contract, but instead appointed Council members Dixon and Peotter to act as an ad hoc committee fleshing out what the City wanted to accomplish, while City staff published a Request for Qualifications for a legislative consultant other than Mr. Henschel. March 7, 2018: Although the California Coastal Commission’s consent is not required to amend the Coastal Act, their position is often influential. On the first day of each of their monthly meetings, the CCC receives a rstaff report on pending legislation. The March 7, 2018, Legislative Report, noted the introduction of AB-2464, but did not suggest a position on it. March 5, 2018: Don Schmitz reports lobbying Coastal Commissioner Ryan Sundberg by phone (see email here). He says he told Sundberg “The PMP would result in taking 80 to 90 CDP’s off the workload for the CCC staff on an annual basis.” The basis of that claim, also made at public meetings in Newport Beach, is unknown. February 27, 2018: Council member Dixon appears to have asked for an update on the Port Master Plan, which the City Manager’s Office promises he will do on March 13 (see email here). February 14, 2018: Assemblyman Matthew Harper, with coauthor State Senator John Moorlach, introduced Assembly Bill 2464, “An act to amend Section 30700 of the Public Resources Code, relating to ports,” proposing to amend the California Coastal Act of 1976 to add “Newport Beach” to the list of ports in the stated section. February 13, 2018: True to the City Manager’s word, as Item 7 on the Consent Calendar at its February 13 meeting, the Council, knowingly or not, adopted an amended Resolution 2018-7 enumerating a list of “strategies” for 2018 including, among other things, that “City staff shall interface with members of the California State Legislature to encourage the introduction and support of legislation that would permit the creation of a Port Master Plan ( or similar device) and allow the City to manage Newport Harbor’s infrastructure and activities under the California Coastal Act.” Taken literally, Resolution 2018-7 took the matter out of the Council’s hands and tasked City staff with formulating and promoting, as it saw fit and without further Council direction, the enactment of state legislation enabling the create of a Port Master Plan, or something similar, for Newport Harbor. Per the video, and minutes, the City Attorney confirmed that Mayor Duffield, who had apparently introduced the idea, would need to recuse himself from this and all future discussion of the Port Master Plan. February 13, 2018: Prior to the Council meeting, City Manager Kiff sends Council member Peotter by email (here) a “Fact Sheet” that he has edited, describing Assemblyman Harper’s bill. February 11, 2018: An email (here) from Council member Will O’Neill to City Manager Kiff mentions O’Neill spoke to former Council member Selich about the Port Master Plan and Selich thinks its a great idea. January 24, 2018: City Manager Dave Kiff forwards to Peotter and Duffield a January 23 email (here) from an employee in Assemblyman Harper’s office apparently expressing concern about a “briefing” memo that seems to have been prepared by Schmitz and Associates noting Coastal Act language saying the four ports listed in the Act should not need to be added to. Kiff says he’ll be finalizing direction with the Council at their January 29 Planning Session. January 22, 2018: An email (here) from City Manager Dave Kiff to Council member Peotter asks Peotter to bring the Port Plan up at the Council’s January 29 Saturday Planning Session as part of the “Year of the Harbor,” with an understanding that funds would be freed up if the Council decided not to go ahead with the $1 million General Plan Update, but with uncertainty if Assemblyman Harper still had an opportunity to introduce legislation. Late 2017: According to page 2 of the staff report presented to the City Council on March 13, 2018, (Item 16) “In late 2017, Council members began working directly with Don Schmitz of Schmitz and Associates to advocate for the Port Master Plan concept and a bill before the Coastal Commission and its staff. ” The Council members involved appear to have been Duffield and Peotter, and their activities appear to have been unknown and unauthorized by the remainder of the Council. There has never been an explanation of who first suggested amending the Coastal Act would be good for Newport Beach. November 28, 2017: City Manager Dave Kiff reports in an email (here) that a contract has been signed with Don Schmitz for Schmitz to assist the City in preparing a Coastal Development Permit for private encroachments onto the the beach at Peninsula Point (the contract in question is C-7217-1). In 1972, California voters approved Proposition 20, an initiative enacting the California Coastal Zone Conservation Act, dealing the state’s coastal areas outside San Francisco Bay, and creating a statewide commission and six regional California Coastal Zone Conservation Commissions, tasked with development permitting authority through 1976 as well as the primary task of developing, by the end of 1975, a comprehensive coastal plan for adoption by the state legislature. The result was the California Coastal Plan of 1975, with some 162 policy recommendations and a systematic mapping of coastal resources. Newport Beach lies in Subareas 10 and 11 of the South Coast District as illustrated at left, for which an extensive descriptive text is provided at the link. The recommendations for the future of the state’s coastal seaports are found in the Water Transportation section. The Plan concluded that “No new general port areas are required in California for the foreseeable future” provided existing ports are utilized to their full potential. Hence Policy 116 declares “No new port areas shall be developed outside existing port cities except for possible specialized facilities such as petroleum or liquefied natural gas (LNG) tanker terminals and naval facilities.” The regional terminal facilities recognized in the Plan (Policy 118b) are San Diego, Los Angeles-Long Beach, Port Hueneme, San Francisco Bay-Stockton-Sacramento, Humboldt Bay, and Crescent City. 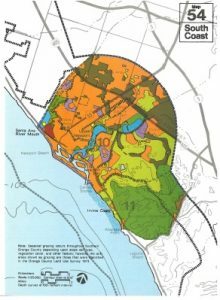 Although it appears never to have been formally adopted by the legislature, the 1975 Coastal Plan provided guidance for the Coastal Act adopted in 1976. The 1976 act includes a Chapter 8 giving somewhat relaxed permitting standards (through preparation of a Port Master Plan) to four of the coastal ports. According to the 1983 book by Sabatier and Mazmanian this seems to have been one of the compromises necessary to get an act passed at all, in this case to reassure the longshoremen’s unions. As introduced, AB-2464 simply adds the two words “Newport Beach” to a list of major seaports in California Public Resources Code Section 30700 (and also seeks a review of whether the City would be eligible for reimbursement of expenses incurred in implementing the new code). AB-1196 adds four words, but apparently with the same intent. The entities currently listed in Section 30700 (and 30112) are “the Ports of Hueneme, Long Beach, Los Angeles, and San Diego Unified Port District,” all of which names refer to recognized deepwater shipping port or harbor districts created and empowered by state law prior to the existence of the Coastal Act (which this passage is within). AB-2464 adds a reference to a (at present) mythical “Port of Newport Beach” whose boundaries and governance structure are undefined. Among other problems, the addition of a new port contradicts the legislative finding from 1976 (found in the following Section 30701(b)) that to limit the impacts of maritime commerce to a restricted number of sites “Coastal planning requires no change in the number or location of the established commercial port districts.” Newport Beach appears to be saying there is a need to create a new commercial port district. The authors also apparently did not notice Section 30112, which explains that “Port governing body“ — a term used in the Port Master Plan sections — “means the Board of Harbor Commissioners or Board of Port Commissioners which has authority over the Ports of Hueneme, Long Beach, Los Angeles, and San Diego Unified Port District.” That would also have to amended to define exactly who the “port governing body” for the “Port of Newport Beach” is. However, also possibly not understood by the authors of AB-2464, adding a name to the list of ports recognized in the Coastal Act does not by itself create a port or a distinct port (or harbor) district. Doing so appears to require following one of the mechanisms provided in Division 8 of the state’s Harbors and Navigation Code. All involve drawing a definite boundary (which generally includes land as well as water) and then, before proceeding, obtaining voter approval from those who would reside in the proposed district. In most cases, extensive additional special state legislation appears to have been required as well (to transfer ownership and other matters). It is unclear if the City, in introducing AB-2464, and now AB-1196, believes such steps would not be needed for a “Port of Newport Beach.” If the normal steps do apply, adding a port that has not yet been created seems problematic. The authors also seem to have missed Section 30114 of the Coastal Act which says that, other than the four named ports (currently the same list as in Chapter 8), all ports and harbors serving as public transportation facilities are to be treated as “public works.” If Newport Beach (or Harbor?) wants the same privileges as the big four, it would presumably need to be mentioned in this section. Otherwise the bill would create an internal conflict within the Act, with Newport named as one kind of port in Chapter 8 and as a different kind in Section 30114. Even the harbors that are merely “public works” are allowed by Section 30605 to pre-submit bundled lists of future projects for certification in a Public Works Plan, after which the Commission’s role is limited to adding additional conditions of approval to the individual projects. This effort, which was offered as a reason for delaying for a year the previously-promised community workshops on the General Plan, would supposedly give the City greater ability to approve development on harbor waters. However, it would require, at a minimum, significant amendments to the state’s Coastal Act and possibly creation of a port district. SPON has concerns about the proposal, the process by which it has been advanced and the suggested consultant. The bill adding Newport Beach to the list, AB-2464, was suggested by unknown parties and introduced in the state legislature with no review by the Council. The ports currently listed in Chapter 8 are listed there, and given special permitting privileges, expressly to confine future heavy maritime commercial activity, such as container terminals, to a limited set of locations along the coast. Newport Harbor does not fit that description, and the Council has stated it has no intention of the harbor becoming such a site — yet the Council wants “Newport Beach” added to the list. It is disturbing that idea of promoting a Port Master Plan been advanced without any public study or as much as a recommendation from the Council’s own Harbor Commission. It is equally disturbing that the words “Port Master Plan” have never appeared on a City Council agenda. All Council discussions, including the present one, have been buried under some other heading. The present action contradicts the action taken by the Council at its last meeting, on March 13, where as Item 16 it asked staff to publish a Request for Qualifications for a legislative consultant other than the one now being recommended. Item 12 includes an appropriation of $32,000 to compensate Mr. Schmitz for work he supposedly already performed without contract, although what that work was is not spelled out. That proposal to provide after-the-fact compensation is in questionable compliance with Article XI, Sec. 10(a) of the California Constitution, which suggests the public should be able to trust municipal services will be provided at a price agreed to before work is performed, not after. Even if retroactive payments for non-contracted work were OK, $32,000 seems like a lot for suggesting adding two words to the Coastal Act and promoting the award of a contract for oneself related to that. Although Mr. Schmitz has worked for the City before, many question his tactics and wonder why, if the Port Master Plan, is a good idea the City could not represent itself. At least in promoting himself, Mr. Schmitz appears to have a tendency to exaggerate facts: in his on-line resume he suggests that “prior to establishing his own consultancy,” he “served as a California Coastal Commission’s South Coast District principal planner on public and private development projects, and coordinator for access and wetlands matters.” Yet the “Education” and “Professional Experience” listed at the end of the same resume suggests he was nothing more than an entry level analyst, fresh out of college and working on a master’s degree at the local state university. After leaving the Commission, in connection with the Sweetwater Mesa project in Malibu, Mr. Schmitz promoted what the then Director said was the most “environmentally devastating” proposal he had seen in 38 years. As exposed by LA Times columnist Steve Lopez, Mr. Schmitz’ ethical radar may be as challenged as his environmental one: an unreported sleepover by a Coastal Commissioner at Mr. Schmitz’ Malibu villa and vineyard contributed to that Commissioner and four others having to stand trial in San Diego. In a March 21 article in the Daily Pilot, Assemblyman Matthew Harper, who introduced the bill, is quoted as saying he expects his fellow Southern California legislators will support the idea of giving local control to the City because it is a recreational amenity of regional importance. It seems to SPON that the harbor being an asset of regional or statewide importance would be precisely why most of the legislature would, instead, find it important to retain state control, making this whole effort most likely a great pipe dream and waste of money. This entry was posted in News, Watch List and tagged coastal act, local coastal plan, Port Master Plan on November 16, 2017 by Jim Mosher.